Schistosomiasis - body, last, contagious, causes, What Is Schistosomiasis? Schistosomiasis (shis-tuh-so-MY-uh-sis) is an illness caused by parasitic * worms. The worms must spend part of their life cycle growing in freshwater snails before they enter and cause infestations * in humans. Schistosomiasis is a parasitic disease that is not directly contagious from person to person. Five types of Schistosoma worm, also called blood flukes, can infest people and cause schistosomiasis: S. mansoni, S. japonicum, S. mekongi, S. intercalatum, and S. haematobium. These parasites have a complex life cycle; they have to go through several separate stages on their way to adulthood, and both snails and humans play important roles in that cycle. Another name for the disease is bilharziasis (bil-har-ZYE-uh-sis) or "snail fever." The worm starts life as an egg in a freshwater source such as a pond, lake, or stream. It hatches into a larva * , and if the right type of aquatic snails live in that water, the larva will find and enter a snail. There it passes through several stages of development. During the last phase in the snail, the parasite turns into a larva that can swim. It then leaves the snail and returns to the water, where it may come into contact with a person; the larva can survive in the water for up to 2 days without a human host. When people bathe, wade, swim, or wash clothes in the water, the parasite can burrow into bare skin and enter the bloodstream. Once it is in the blood, it matures into an adult worm. Depending on the species, the female adult worms lay their eggs within blood vessels near the person's bladder or liver. The eggs gradually move to the urinary tract, liver, and intestines * . Over time, some eggs pass through the urinary tract and intestines and are excreted when the person urinates or has a bowel movement. If feces (excreted waste) from an infested person contaminate a freshwater source such as a pond, the eggs can enter the water and begin the parasite life cycle all over again. * Infestations refer to illnesses caused by multi-celled parasitic organisms, such as tapeworms, roundworms, or protozoa. * larva (LAR-vuh) is the immature form of an insect or worm that hatches from an egg. Schistosomiasis is not seen in the United States. However, the disease has a major impact on millions of people around the world in developing countries. According to the World Health Organization, more than 200 million people worldwide are infested with the worms, with 20 million of those having serious symptoms. The disease is most common in tropical parts of the world, where it is a leading cause of illness. The parasites that cause schistosomiasis can be found in southern China, parts of the Middle East, and some countries in the Caribbean, South America, Africa, and southeast Asia. People from the United States who travel to those areas sometimes develop schistosomiasis if they swim or wade in tainted water, but they rarely get the severe, chronic * form of the disease. A rash and itchy skin, particularly at the spot where the parasite burrowed into the body, may develop within a few days. The worms then mature and spread through the bloodstream, and 1 to 2 months later patients may have muscle aches, fever, chills, and cough. It is not uncommon, however, for people to not show any symptoms during this early stage of infestation. Over time, as the worms spread into the liver and intestines, patients can experience diarrhea (dye-uh-REE-uh), liver enlargement, vomiting, and abdominal * pain. If the doctor suspects schistosomiasis, he or she will collect a urine or stool (bowel movement) sample to look for the worm's eggs. Several samples may need to be examined before the worms can be identified. The doctor also may take a sample of blood for testing, although the blood test may not show evidence of the infestation unless it is done 6 to 8 weeks after the patient's contact with the parasite. Occasionally, a tissue biopsy * will be done to check for signs of the parasite in organs such as the liver. Doctors can prescribe medicine to treat the infestation. Patients usually need to take pills for only 1 to 2 days. Without treatment, and with continued use of the same tainted water source, the illness can last for years. People who become re-infested with schistosomiasis again and again over many years can develop damage to the bladder, lungs, intestines, and liver; the disease is one of the leading causes of cirrhosis * in the world. In some cases, scarring of the liver is so severe that blood flowing through the organ becomes partly blocked, causing a condition known as portal hypertension. Severe portal hypertension can make veins in the esophagus * and stomach swell and bleed, sometimes to the point that the bleeding is fatal. 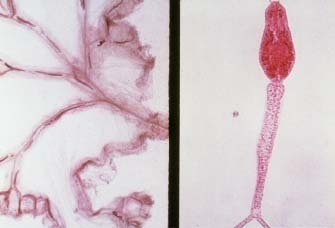 Flatworm flukes: on the left, Schistosoma japonicum, on the right, Schistosoma mansoni. These parasites can enter the human body through the skin and then develop into an adult worm in the bloodstream. Other complications of the disease arise when the worm's eggs travel through the bloodstream to the spinal cord or brain, where they can cause seizures * , inflammation of the spinal cord, or paralysis * . Experts advise that travelers visiting countries where schistosomiasis occurs avoid wading, swimming, or bathing in any body of fresh water such as ponds, rivers, or lakes. Filtering or boiling drinking water for at least 1 minute will kill parasites, including the Schistosoma worms. The U.S. Centers for Disease Control and Prevention also recommends heating bathing water to 150 degrees Fahrenheit for at least 5 minutes to make sure it is free of potential parasites. To reduce the spread of schistosomiasis, health officials focus on educating people who live in areas where the worms are found. They teach the public how the parasites spread and encourage people not to urinate or have bowel movements in rivers and ponds. U.S. Centers for Disease Control and Prevention (CDC), 1600 Clifton Road, Atlanta, GA 30333. The CDC is the U.S. government authority for information about infectious and other diseases. The organization provides information about schistosomiasis at its website. World Health Organization (WHO), Avenue Appia 20, 1211 Geneva 27, Switzerland. WHO provides information about schistosomiasis at its website. How long can bilharzia remain in a human body without showing symptoms or being detected?